Ever since I hit puberty back in 5th and 6th grade and discovered I actually had curly/wavy hair, I have struggled to find the right hairstylist for my crazy thick hair. For over 8 years, I was never able to walk out of a salon and head straight to my next event without having to come home and wash and style it myself first. Seriously. Isn't the point of getting your hair done so that hair experts can make it look better? I had decent hair cuts (though I'll never understand why I've had to grow out one section of my hair for the past 4+ years because it kept getting cut shorter than the rest to compensate for its heaviness), but no one really understood how to style or shape my type of curls. After spending so much money at the salon, I was always disappointed in my experiences, but never really had another choice. I tried salon after salon and found the same results. I am also a self-proclaimed hair product junkie. I've tried it all--drug store and salon-quality--and I have poured over NaturallyCurly.Com's product forums. In many ways, I've self-taught myself how to care for my sometimes straight, sometimes curly waves. I know pineapple-ing doesn't work for me, I prefer No-Poo, and I really can't believe I haven't purchased a satin pillowcase yet. You know I'm comfortable around you if I've "plopped" my hair in front of you and you'll often find me with metal clips in my roots while I'm using those big scary diffusers to slowly dry my hair. (Have I gone over your head yet? I'll explain those processes another day.) I've learned that so much of your hair's results lies in its care. But the secret to really great curls starts with a really great cut. I am so excited to share that after many years of searching, I have discovered a salon that understands my curls AND knows how to shape them to twirl their best: Kelly Elaine Inc.
Kelly Elaine Inc. is Pittsburgh's premiere curly hair salon and the only hair salon specially trained in the Deva Curl cutting and styling method with the Pintura color technique. The Greater Pittsburgh Area has a few salons who do Deva Curl cuts (trust me, I've tried them), but I have not had the same personalization and custom attention anywhere else. These other salons are also not curl-specific and I've found that these stylists are not 100% committed to the technique. Kelly and Victoria are members of Curly Hair Artistry, founded by Scott Musgrave, and regularly meet up and train with curly hair experts all around the world. They are dedicated to constantly improving their craft, which I admire since my hair is always changing and it's so necessary to adapt to changes with new concepts and techniques. Check to see if your stylist is a part of this group. Since then, she and her other stylist Victoria have received 5/5 ratings from dozens of satisfied curlies. And there's even more on Facebook and on her website! When I moved away for a little under two years right out of school, I had to go to a new stylist and it just never lived up to the quality of cuts I receive regularly from Kelly and Victoria. When I moved back to Pittsburgh eight months ago, one of the first things I thought about was how I could now get great haircuts again! While I'm at the salon, I always feel like my needs are being met and that my concerns are being heard. I completely trust both Victoria and Kelly with my hair, which I have not been able to say with any other stylist in the past. We start every appointment with a consultation and then they cut my hair dry, which may be a foreign concept for some of you! Then, it's off to washing and styling. Throughout it all, we laugh, talk curls, and relax. What should you mention to your stylist during a consultation? What questions should you ask? First off, for Kelly Elaine Inc., the consultation starts on the phone, so it is just continued once the guest is in the chair. We request the guest send us pictures of their hair before they come so we can already get a feel for what they need and then we can customize the consultation from there. Discuss your daily routine, the style you would like, if you are growing your length or going for a big chop! One should always ask if the stylist performs a dry cut! Research and see what education the stylist has before you go ask to speak to them or stop in the salon. Even if they are busy you can get a feel for if curls are their passion and their curly hair beliefs are in line with what makes sense to you. Seeking out stylists from Curly Hair Artistry is beneficial because we are a very specialized international group that is highly trained and passionate about curls! Starting there will also help you achieve the best consultation once you find your curly oasis. Why do you cut curls dry? We choose to cut curls dry in order to take into consideration how much spring factor in in each curl and, besides, we wear our hair dry not wet! Do you recommend any inexpensive alternatives for curly hair products? If so, what are they? How do you know which products to mix for a "curly cocktail?" The "Curly Cocktail" or product infusion decisions are based solely on good ol' trial and error. It's interesting how sometimes a product can layer well but doesn't always mix well in the palm of your hand. What works on some may not work on others. One of the latest infusions we are loving in CHA Curly Hair Artistry is DevaCurl Frizz Free Volumizing Foam or the new Raw Curls Mousse applied to the hair first then some Jessicurl Spiralicious layered on top. This is suggested for our finer haired guests, but like I said before it's great to experiment within Curly Girl friendly product lines! During my last trip to the salon, Victoria added highlights using the Pintura technique and toned my hair perfectly. She's cut my hair in the past (as you can see, my "before" pictures aren't really so bad! That's because my hair was growing out from my last awesome cut. You probably saw my previous before/after on Instagram!) For this particular style, Kelly tried a new curly cocktail, layering Briogeo, followed byDeva Curl Ultra Defining Gel mixed with Deva Curl Set it Free, and sealing it off with Jessicurl Spiralicious. I'll share another post about application and styling in the future! If you want to see other curly before/afters (especially if you have a different curl type than mine), check out their incredible transformation board on Pinterest or check out their frequently-updated Instagram. But wait, there's more! 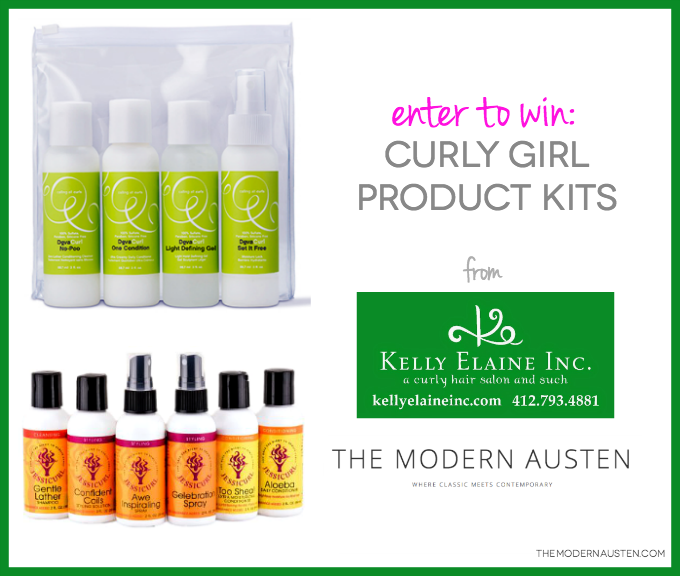 Kelly has so generously offered FOUR lucky readers an amazing curly-haired surprise. I'll be giving away two of the four prizes in today's giveaway, so stayed tuned for the last two prizes in a future post! This is what I use on a regular basis for my curls! A fantastic curly hair line that I definitely want to look more into. Details: Giveaway is open to Continental U.S. residents only. Winners' entries will be verified and contacted via email. First winner randomly chosen will have the choice between the two prizes. Giveaway will be open until 10/22 at midnight! Disclaimer: I was provided a free hair cut in exchange for posting this review. As always, my opinions are my own and I have and will continue to pay for Kelly Elaine Inc.'s services. There are also some affiliate links in this post. Thank you for supporting the brands that make The Modern Austen possible!